The 2019 ŠKODA Tour de Conamara International Sportive will take place on Saturday 25th May, starting and finishing in Clifden. Registration is now closed as the event is full after only 24 hours of registration. We do not operate a waiting list as we have reached event capacity. As stated as part of the event registration process and in the event terms and conditions there are no refunds or deferrals are issued for the event. We allow the transfer of places between cyclists up to ten days before the event. We do not operate a waiting list so it is up to the cyclists to arrange for another cyclist to take his/ her slot if they are transferring their place. Please do not attempt to cycle under someone else’s name without transferring through eventmaster. You should email support@eventmaster.ie in order to transfer a place between cyclists. There is an adminstration fee of €5.00 for place transfers that will be charged by eventmaster during the transfer process. Please note there are no deferrals to next years event or to another event in the Celtic Series. If a cyclist takes a transfer place and does not go through the proper transfer process they will not be entitled to take part in the event or registered to receive event supports. This will be strictly enforced this year. To sign on for the event and collect your event ID you must bring the confirmation of registration form that you received by email when you registered. This will be scanned from your phone or if you print out the form. Your form (on your device or ptinted) will be used for scanning you into the event and is designed to speed up the registration process for cyclists. If you did not receive the registration form when you registered contact support@eventmaster.ie – Please do not leave this to the day before or day of the event to check as the team will all be on site. Wednesday 22nd May is the last day for online support in relation to your eTickets. The majority of technical issues / bike failures happen in the first 20-30km of the event. This is because cyclists do not check their bikes or simply pump their tyres. Avoid the hassle of a mechanical issue by getting your bike looked at or simply pumping your wheels. Don’t forget to bring spare tubes for your wheels. Bike mechanics are located at each feed station. There are a number of roving bike mechanics that will try and sort out any issue on the route but you may be brought to a feed station if additional work is required. • Both cycles start from the courtyard of the Clifden Station House Hotel. • If you are cycling in the 80km event please do not enter the start area with your bike until the 140km cyclists depart at 9.30am. • Please leave plenty of time to get to the event sign on as there will be a lot of traffic on the access roads to Clifden. There will be three options for participants to sign on for the event. At sign on you will receive your event jersey and event ID. You must display your event id to gain access to the feed stations and avail of on route supports. You will need your event wristband to get the BBQ at the end of the event. Event sign on starts at 7.30am on the morning of the event. The event office is located in the Hotel Theatre directly beside the Clifden Station House Hotel. YOU MUST BRING YOUR EVENT TICKET THAT WILL BE SCANNED TO ALLOW YOU ACCESS TO THE SIGN ON AREA. This was sent to you when you registered and includes a bar code for scanning. You will also have to sign this form before you arrive. Sign it when you print it and avoid delays. 1. You will receive your ŠKODA Tour de Conamara cycling gift and event materials – Cyclists who purchased an event jersey when they registrated will recieve them at sign on. The jersey size ordered will be the jersey you will recieve. 2. You will also receive your event identification that you must wear in order to access the Feed Stations and gain access to the event start area. 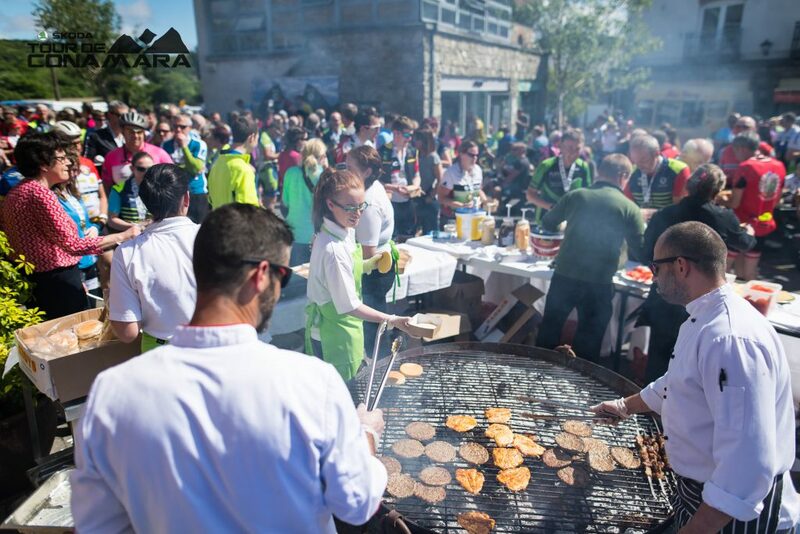 (You will replace a bike tag and wristband) You must present your ID wristband at the end of the cycle in order to get your BBQ burger at the Clifden Station House Hotel. 3. Event map and event safety guidelines. 1. Bike Event ID – to be attached to your seat post – without this bike ID you will not be able to enter the start area or avail or on route services / supports and food stops. 2. Event wristband with bar code and event number – You must wear this event wristband in order to cycle. This will contain the event emergency numbers. These will be colour coded based on the event you are cycling i.e. 140km or 80km. You will need to display your event number to access the food and refuel stops on the routes. There are a number of dedicated event Car Parks including the Clifden Commercial Mart and the Eir site on the Galway entrance to the town directly after the Gardai Station. Please do not park on Church grounds in Clifden or in commercial retail car parks (LIDL or ALDI). Please respect the residents of Clifden and commercial premises in the town. NB: The ŠKODA Tour de Conamara is not a closed road event and you must adhere to the normal rules of the road. Cycling on the route is maximum of two a breast. • The event is a sportive and not a race and you are responsible for your own safety and the safety of others on the road. • Your will receive an event map and key safety details at event sign on. • The routes selected for the ŠKODA Tour de Conamara are generally quiet roads but you will encounter some main road junctions. Be please aware of traffic on all roads. • All participants will be provided with an emergency contact number in the case of an emergency on the route. Please note this is not a number for bike repairs. • You are responsible for taking part in the event on a safe and suitable bike. Participants are responsible for their own bike maintenance. There is limited mechanical support system will be in place and will sweep throughout the route. Don’t ruin your enjoyment of your day by turning up on a bike that has not been checked. • Please ensure you have spare tubes in the event of a puncture and do not rely on the emergency number for help with changing punctures etc. If you register for the 140km you cannot access the 80km feed station which is only stocked with refreshments for those who registered for the 80km. Carna is the first dedicated food stop for the 140km which comes 10km after the Cashel feed station. The feed stations for the 80km route are located at the Cashel Community Centre (located at 39km) plus a refuel station at Kylemore (60km) (water only). Please note that if you do not avail of the first stop at Cashel Community Centre, it will be 60km before you reach the Refuel station. The refuel station is a water break and not a feed station. We recommend you also bring also your own supply of cycling gels, bars and drinks. Ambulances and roving paramedics will be available all day, should anyone require medical assistance it will be administered in the fastest possible time-frame. Please call the emergency contact number provided on the day for medical emergencies. The route is numbered in zones marked out every 20km. Please take note of the zones in case you need to report an emergency. The 140km and 80km routes are marked out with distinctive ŠKODA directional signage. – Wind / Rainproof top – Participants must be aware that weather conditions in this area can change and you should bring appropriate clothing to keep warm in any adverse weather. – Sunblock – we hope you will need plenty of this. There will be on-route photographers capturing pictures of as many cyclists taking part in the event as possible. The event cannot guarantee that all cyclists will be photographed but will be doing our best. Photographers will be at the event finish and podium area as well. Images will be uploaded to our Facebook page after the event. Showers will be provided at Clifden GAA Clubhouse and at the Clifden Station House Hotel. Please be aware that these facilities have a maximum capacity and you may be directed to one or other. Clifden and the wider Connemara area is ready and waiting for the cyclists and their friends and family. A wide range of entertainment options will be hosted in the area on the night before and night of the ŠKODA Tour de Conamara. Music and entertainment is available in the Clifden Station House Hotel, EJ Kings, Guys, Lowrys and plenty more venues throughout the area. LEAVE NO TRACE: The event operates under a Leave Non Trace litter policy. Please respect the Connemara countryside and its residents and bring home your litter. Please do not litter the area with gel sachets, empty bottles or food wrappings etc. We are committed to improving our environmental practices each year which includes reducing levels of packaging, printed materials and use of plastic. PUNCTURES Please ensure you can change a puncture and bring spare tubes. It may be some time before support can arrive to a spot where a cyclist may have picked up a puncture so please ensure you can change your own wheel or cycle with someone that will assist you to avoid long delays that will impact on your enjoyment of the day. 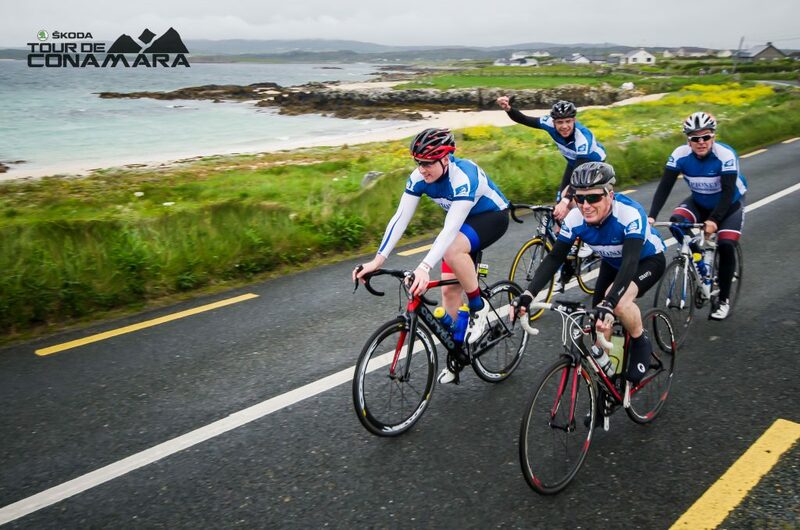 We hope you have a great day on what we believe is Ireland’s most scenic cycling sportif around set against the backdrop Connemara and the Wild Atlantic Way.